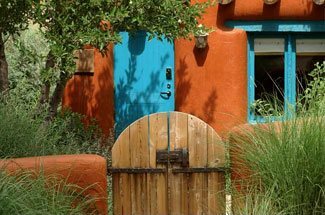 The beautiful city of Santa Fe offers more than 50 scenic parks to enjoy a leisurely stroll or simply relax and take in the natural beauty of New Mexico. Of them all, Cathedral Park in Santa Fe is definitely one of the most popular. Located right beside the historic Cathedral Basilica of St. Francis, this lovely park provides visitors with a peaceful setting to relax, unwind, and learn more about the city’s history. Here is everything you need to know about Cathedral Park and how to make the most out of your visit. Find more local attractions like Cathedral Park in Santa Fe when you download your free copy of our Vacation Guide! This complimentary planning tool is the only thing you’ll need to find all the best Santa Fe activities, entertainment, dining, and more. On May 26th, 1856, the land upon which Cathedral Park in Santa Fe sits was purchased by Bishop Jean Baptiste Lamy. After re-selling it to the Superior Sisters of Charity, the park was turned into the original site for the St. Vincent Sanitorium. A fire destroyed the sanitorium in 1896, but it was restored to its original glory 12 years later. In 1954, the park was once again transformed into Marian Hall, a school for nurses. Throughout the years, the park grew larger and larger to accommodate the wide amount of locals and visitors who passed through. Today, Cathedral Park in Santa Fe forms an important piece of the city’s historical district. The Cathedral Park in Santa Fe is a grassy and serene place to rest your feet and enjoy the gorgeous views of the city’s most beautiful cathedral. It’s convenient location on Palace Avenue and Marian Hall also makes it easy to access after a full day of exploring the city. Of course, visitors don’t just come here to de-stress. Cathedral Park is also filled with plaques describing the history of the area and the park itself. That way, while you’re relaxing and enjoying the view, you can learn fun facts and better understand the stories behind the place you are standing in. The Cathedral Basilica of St. Francis of Assisi is one of Santa Fe’s most popular attractions and perfectly embodies the incredible history of New Mexico’s capital city. The gorgeous architecture has also wowed visitors from all over the world with its Romanesque Revival style and stunning Corinthian columns. Whether you’re attending one of their Catholic services or simply stopping in to marvel at the church’s beauty, visiting the cathedral is a must during your Santa Fe getaway! From March to December, Cathedral Park comes alive with awe-inspiring local art at the Artist Market in Santa Fe. From pottery and furniture to paintings and textiles, you’ll discover a wide variety of incredible masterpieces crafted by artists native to New Mexico. The best part? You’ll be able to take your favorite pieces home with you! There are so many wonderful historic and architectural features throughout Santa Fe. From the Cathedral Park in Santa Fe to the many local cultural museums, the area is rich in history. Discover even more wonderful attractions and beautiful structures during your vacation at Four Kachinas. We hope to be your home base during your many Santa Fe adventures. 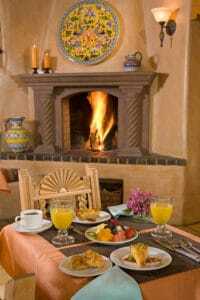 Our bed and breakfast offers close proximity to the cultural hub of Santa Fe, as well as some authentic Southwestern charm. Plus, you’ll enjoy a complimentary hot breakfast each morning of your stay! It’s everything you need and more to create memories that you’ll always cherish. 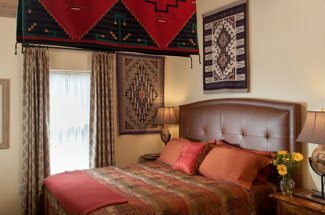 View our rooms today, and book your stay in Santa Fe!